Gil Hedley calls himself a somanaut. Like an astronaut who navigates outer space, a somanaut is dedicated to exploring the inner space that makes us the magical human beings that we are. I’ve taken workshops from Gil in the past and he’s an off-beat, charming, and brilliant anatomist. Check out “fuzz, food, inflammation, and movement” for a blog post I did on Gil, inflammation, and inner space several years ago. That post includes his famous Fuzz Video, which is definitely worth watching. My last two posts were on bacterial inner space (see links below) and this post tops off the series with a test to see how good your interoceptive skills are. In other words, how well you know your inner space. Grab yourself a stopwatch and a calculator (unless you’re a math wizard and can do this in your head). Sit quietly in a comfortable chair with your hands resting in your lap or on your thighs. Don’t cross your legs. Take a few deep breaths and relax. Start the stopwatch and count your heartbeats by feeling your heart’s rhythm for one minute. Don’t touch your neck (carotid artery), your wrist (radial artery), or your heart—just sense when your heart beats and keep track of the number. Write the number down. Now, using your fingers (preferably your index and middle finger), find your pulse on the inside of your wrist. Don’t use your thumb, as it has its own pulse. You can also find your pulse on either side of your neck. Use whichever one works best for you and count the beats for one minute in the normal way (using your fingers). Wait a couple of minutes and do it again for one minute using your fingers. Average the two measurements in which you used your fingers to monitor your pulse. Calculate the difference between your heartbeat estimate and the average of your two pulse counts using your fingers. Take the absolute value of the difference—you don’t need to know whether you overshot or undercounted, just the amount by which you missed the mark. Then divide by your average pulse and subtract that result from 1. Here’s the formula. If your result was 0.80 or higher, your interoceptive abilities are awesome. A score of 0.60 to 0.79 means you have a moderately good sense of your inner space. A result below 0.59 indicates that you need to work on getting to know yourself a little better. I say this often, but the more you understand what’s going on inside, the more likely you are to take good care of your inner space. Your body is a temple, go inside and check it out. It’s magical. Peace, love, and inner space. 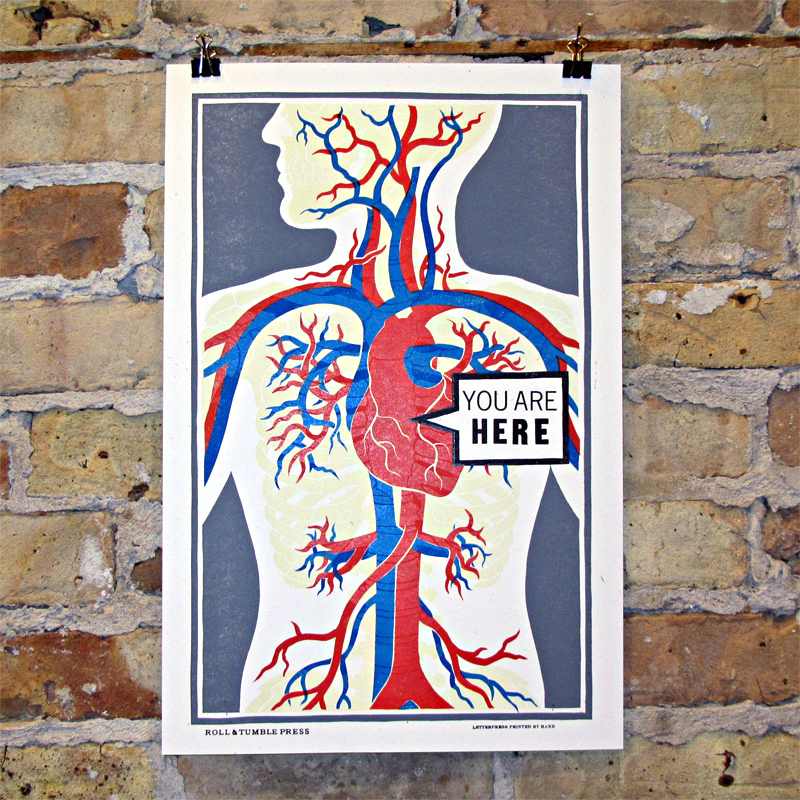 • Use of the above You Are Here letterpress print by Roll & Tumble Press courtesy of Street Anatomy (Anatomy & Pop Culture Gallery Store). Print available here. • Interoceptive testing formula found in Scientific American MIND, May/June 2012.